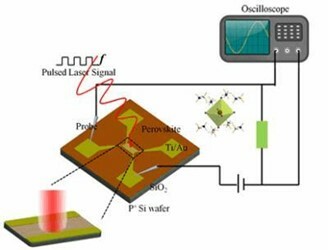 The researchers investigated the morphology, light absorption and the crystal phases of the perovskite film at the different annealing temperature after gas-reaction to obtain the high-quality perovskite film. The devices exhibited high responsivity and detectivity of 5.87AW-1 and 1012 Jones. The response time of the device is estimated to be 248 µs/207 µs, which is faster than most previous reports via the solution method. Remarkably, the responsivity and detectivity are estimated to be 0.26 AW-1, 2.13¡Á1010 Jones after lasting exposure in air (25oC, RH~40%) for up to two months. This improvement of the stability of the devices demonstrates that the well-controlled vapor deposition method allows a thorough removal of the residual solvents (i.e. DMF, DMSO et. al) and thus effectively promotes a high-quality crystallization of perovskite grains, reducing the metastable phases among the thin films. World Scientific Publishing is a leading independent publisher of books and journals for the scholarly, research, professional and educational communities. The company publishes about 600 books annually and about 130 journals in various fields. World Scientific collaborates with prestigious organisations like the Nobel Foundation and US National Academies Press to bring high quality academic and professional content to researchers and academics worldwide. For more information, visit www.worldscientific.com. SOURCE: World Scientific Publishing Co.